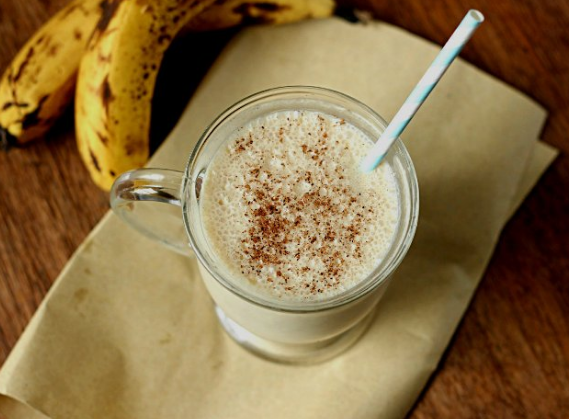 Make Banana juice Happy Toddler .Bananas are one of the fruits which are consumed by infants and toddlers. Even in infants aged 6 months upwards, banana fruit is generally used as first introduced in them. Bananas are classified as a fruit of safe consumption by infants, including infants who are new to the food. Not only easy to digest, but bananas are also very rarely cause allergies in infants. One of the benefits of bananas remarkable is its ability to improve mood child. Because bananas contain vitamin B6 is fairly high. Vitamin B6 is what serves to convert the amino acid tryptophan into serotonin, which can calm the brain and stabilize mood child. Bananas also contain potassium which is helpful to strengthen the muscles so that the child can move to a more optimal. Also in the banana contains three natural sugars, sucrose, fructose, and glucose. Natural sugars that can provide energy for active children. Not only useful for the body only, you know, bananas are also beneficial for the brain. Based on the research results, potassium contained in bananas also serves to optimize the performance of the brain primarily associated with memory and learning activities. Yuk mother, just try the banana juice recipes this one, yes. 0 Komentar Untuk "Make Banana juice Happy Toddler"